There's a bit of Bengal in every state,every part of India.During several of my journeys in the north east and further north,I met many Bengalis,there's a spirit of inborn festivity in them,that makes them so recognisable .Jovial and artistic,cultural and ethnic.I may be a little inclined towards them thanks to my dad who got posted in and around west Bengal many times. "Ektu ektu" bengali I can understand.But that's it to it.I worked in Kolkata after my college,in an area "SALT LAKE" which was a lovely experience.I still cant forget the fried fish with rice at the dhaba we used to get nearby all for 22 Rs and it was awesome. What does Bengal makes you think about?Of course the hot stunning fitness freak Bipasha Basu,but there's one more I admire personally is Sushmita's elegance and the ease to how she leads the men and her life in general.Then there's Kajol and rani.Kajol's a natural,she has the spark in her that makes the character live.Nor is she a model,she is just a regular person like me and you.Maybe,digging in the stars life is so interesting,we want to know everything about them.What they eat,where they go,who they sleep with,their affairs,everything.Bengal is mostly synonymous with rosogullas,phuchkas,howrah bridge,the movie "parineeta","rabidranath tagore","victoria memorial". So,when I moved to Bengaluru,I had this thing in me "that I am going to miss Bengal somehow",because I found the attitude of people in Bengaluru a little different,very professional.Every one here is in a rat race,whereas Bengal was more relaxed.Especially durga puja.After about one year,yesterday I decided to check out a bengali food joint in Pheonix Market City,the newly opened mall in Bengaluru.Amonst other food joints at the food courts , I decided to try out a restaurant named "Howrah Bridge". 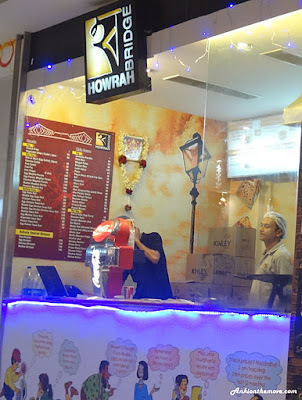 Howrah Bridge: Scanning through the menu items,I found pompret fry a good option.So when I asked "bhaiya pomfret hai? ",he almost said "no mam,nahi." asking one his cooks.A little disappointed as I was,I decided to try out "Fish fry".I desperately wanted to try out fish,its hard to find a decent restaurant in Bengaluru which serves well made fish.To which he replied "mam bhetki ache" and one more fish to which he said I shouldnt try cauz it has too many kantas.Hmm..left with no other option,I decided to give it a try.To my surprise after a wait of about 5 minutes my fish was ready.Bhetki fry with chat masala.I was a little sceptical,before trying my hand,cauz my past experience with fish in Bengaluru have been not so good.It turned out to be a well made spicy fish fry,all for Rs 70.Yipee,at last I found a fish like in Bengal.Though my search is still on. At last,I found amar Bangla In Namma Bengaluru and I was more than happy. Want to learn Bengali In Bengaluru,coming up with videos soon.